Earlier, if you had a tooth decay, you'd probably lose that tooth. Today, with a special Dental procedure called a Root canal therapy you may save that tooth. Our tooth is made up of 3 layers viz. enamel, dentin and pulp. Of these three layers it is the pulp which provides the nutrients to the tooth.Pulp tissue runs down the Root of the tooth like a thread. It is when the infection reaches to the deep seated pulp that your Best dentist in Pune advises you for the Root canal. When the pulp is diseased or infected due to decay, the pulp tissue dies. If you do not remove this infected pulp tissue, you could lose your tooth. After the dentist removes the pulp, the Root canal treatment in Pune is cleansed and sealed off to protect it. Then your Good Dentist in Pune places a crown over the tooth to help make it stronger. Most of the time, a Root canal treatment in Pune is a relatively simple procedure with little or no discomfort involving one to three visits. Best of all, it can save your tooth and your smile for a lifetime! •	Tooth decay or a large restoration and an abscess. •	Repeated procedures on a tooth cause cumulative assault (ie. refilling or recrowning a tooth). 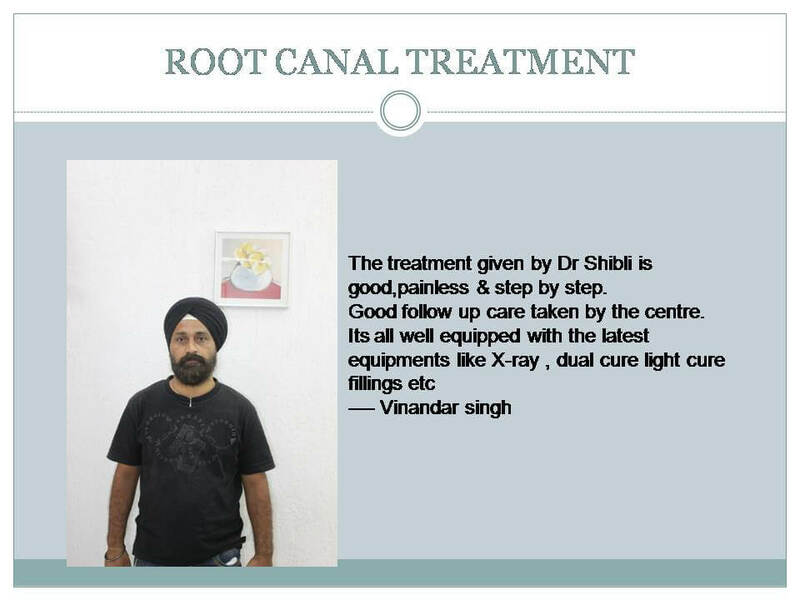 What is Root canal treatment in Pune? Root canal treatment (also called endodontics) is needed when the blood or nerve supply of the tooth (known as the pulp) is infected through decay or injury. You may not feel any pain in the early stages of the infection. In some cases, your tooth could darken in colour, which may mean that the nerve of the tooth has died (or is dying). This would need Root canal treatment in Pune. If the pulp becomes infected, the infection may spread through the Root canal system of the tooth. This may eventually lead to an abscess (gum boil). An abscess is an inflamed area in which pus collects and can cause swelling of the tissues around the tooth. The symptoms of an abscess can range from a dull ache to severe pain and the tooth may be tender when you bite. If Root canal treatment in Pune is not carried out, the infection will spread and the tooth may need to be taken out. Will Root canal cause Discomfort ? During the Root canal the tooth is anesthetized (numbed). There should be no feeling at all. Should Antibiotics be taken before an Root canal ? It is important that you take your antibiotics to help rid the area of infection. No because it is done under local anaesthesia. There may be some tenderness afterwards but this should gradually get less over time. No. A Root canal is not always successful, but it is a therapy with a high rate of success. Sometimes the infection never clears up and the tooth has to be either: a) retreated, b) have an apicoectomy and retrofill (lay the gum tissue back, curette out the infection, and smooth off the end of the Root), or c) extract the tooth. Because the success or failure of a Root canal can result from causes that are not under our control (such as tooth anatomy, breakage of endontic files in the Root, or a low patient immune system), we have the following policy: If your Root canal fails within one year of treatment we will follow up with an equal cost amount of treatment to restore the area. However, if your Root canal fails after one year it is our policy to perform the necessary treatment at our normal fees. 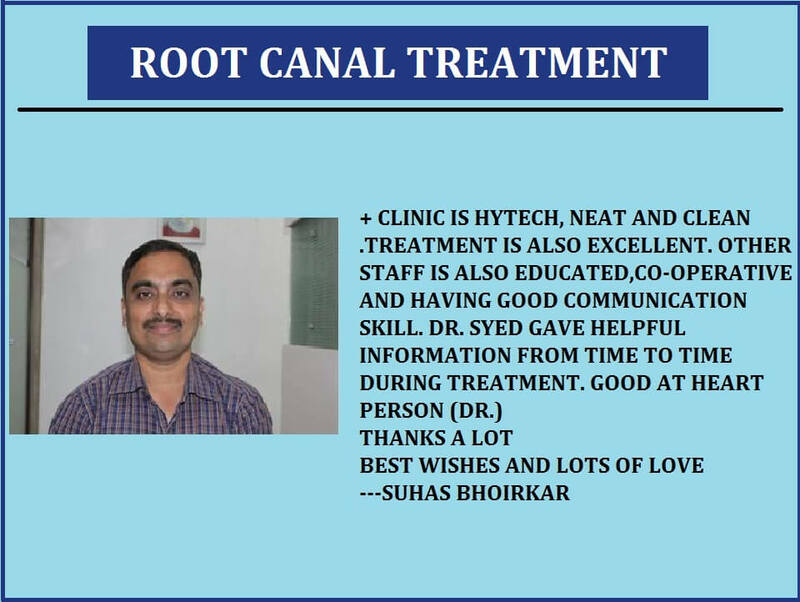 Root canal treatment in Pune is a skilled and time-consuming procedure. Most courses of treatment will involve two or more visits to your Best dentist in Pune. At the first appointment, the infected pulp is removed, and any abscesses can be drained. The Root canal is then cleaned and shaped ready for the filling. A temporary filling is put in and the tooth is left to settle. 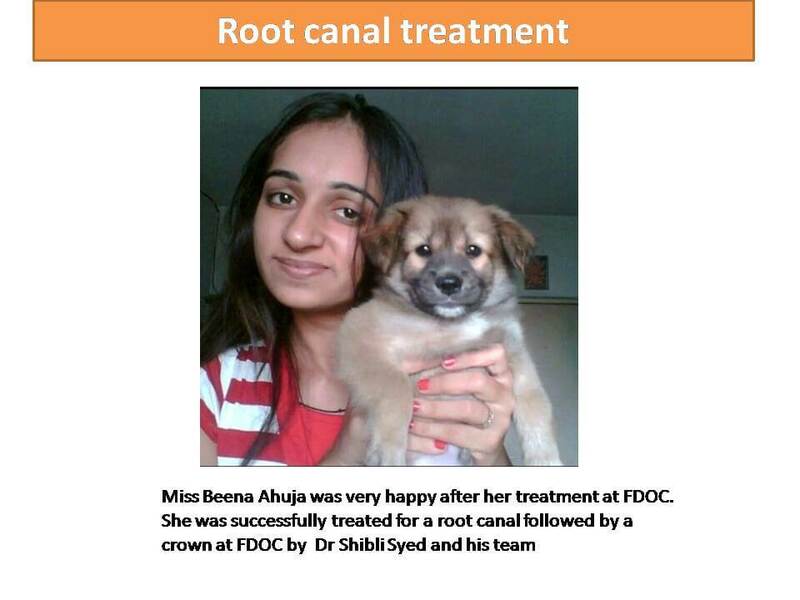 Root canal treatment is usually very successful. However, if the infection comes back, the treatment can sometimes be repeated. Yes. However, as a dead tooth is more brittle, so for extra strength and support, cap is compulsory after the Root canal. What if I don't do the Root canal ? The alternative is to have the tooth out. Once infected the pulp can't heal on itself, and it is not recommended to leave an infected tooth in the mouth. What are the complications that may arise after the Root canal? The tooth may be tender for few days after a Root canal because the area around the tooth is inflamed. After the Root canal, build-up and crown, the tooth should appear and feel like a natural tooth. 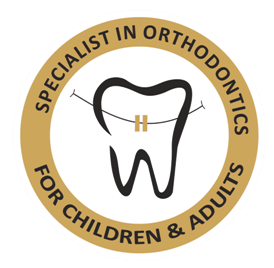 Root-treated teeth should be treated just the same as any other tooth. Remember to clean your teeth for two minutes, twice a day. Cut down on sugary foods and drinks. See your dentist once in every 6 months for regular oral prophylaxis. 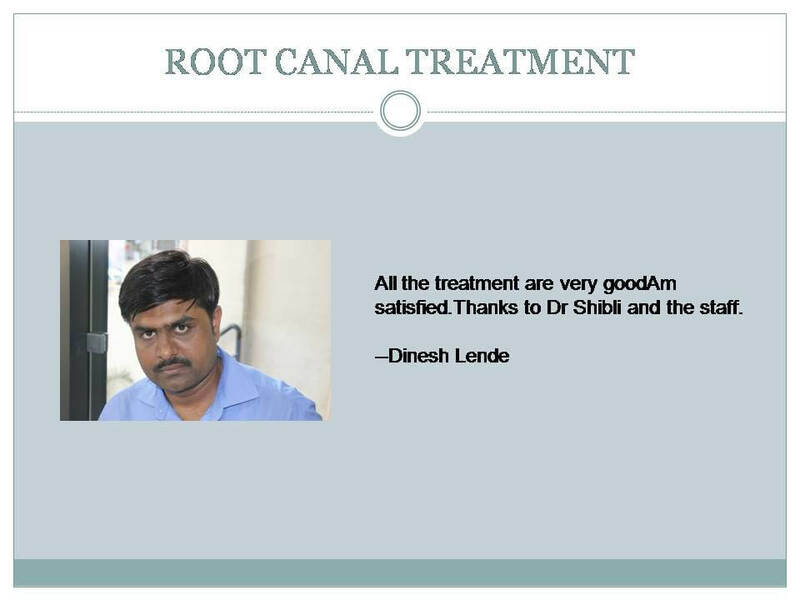 For more information on Root canals please feel free to chat with us online or fill your query in our contact us form. Our executives are more than willing to help you 24 X 7.